A quick, fabulous side dish made with teeny tiny mini potatoes and fresh garden herbs such as rosemary made on the stove or roasted on the grill. Minimal effort with excellent results. This adorable dish would be the perfect side to a Roast Turkey or Stuffed Turkey Breasts with Butternut Squash and Figs main dish and paired with some greens like Roasted Parmesan String Beans or Roasted Broccoli with Smashed Garlic. I’m a sucker for anything miniature. Whenever I see these cute little potatoes in Trader Joe’s I just can’t pass them up. Aside from their cute factor, these waxy little potatoes cook quickly and require very little fuss. They go great with just about anything from steak to chicken. You can cook them on the stove as I did here, or you can make foil packets and cook them right on the grill, perfect if you are going camping! 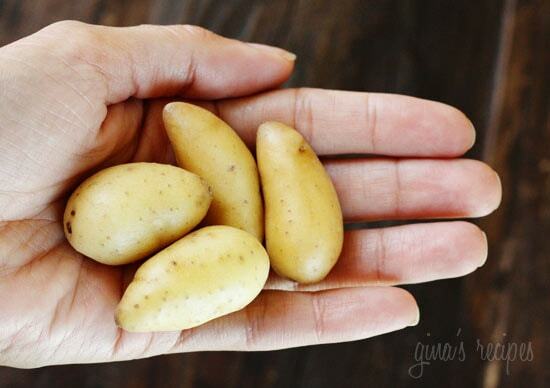 If you can’t find teeny tiny potatoes, use baby potatoes or fingerlings instead (you may need to adjust cooking time). Place potatoes in a skillet with oil, salt and pepper on low heat. Cook with a tight lid on for about 20-25 minutes, shaking the pan occasionally to prevent the potatoes from burning. Remove from heat and let them sit 5 minutes without removing the lid. Toss with fresh herbs and serve hot. 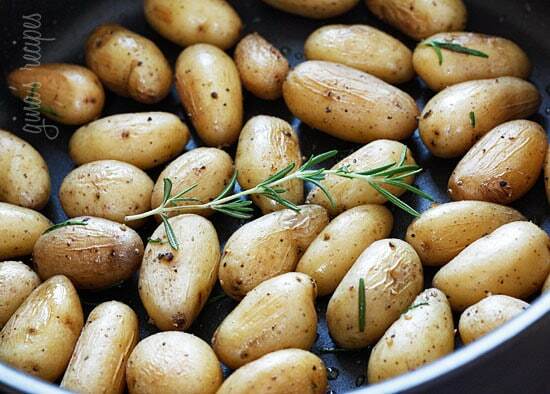 Toss potatoes with oil, rosemary, salt and pepper. Make 4 foil packets with aluminum foil and divide potatoes between each packet; tightly close foil. Grill on low heat for 20-25 minutes; let them rest for 5 minutes before opening foil. Be careful with the steam when you open the packets. 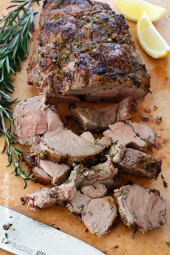 Perfect to go with our prime rib or fancy beef for Chrismas dinner. I literally JUST made this exact recipe before I saw the post haha they were awesome!! Having these with red, purple and yellow baby pototoes from Loblaws, in Ontario, Canada along with my first ever Roasted Leg of Lamb that I got from the butcher yesterday. Everything is cooking and I can't wait. Thanks for posting the recipes for both. It will be an Easter Dinner my family has never had before and I know it will be a huge success. Happy Easter to all who celebrate. I've been making this for a few years now but I boil the potatoes and then mix them with the oil, salt and rosemary. It's very fast that way but I'll have to try it on the stove next time. They are also great cold – I've done many veggie trays for parties and had this as one of the items. It's always a hit although people intially think they are giant olives. So that's the running joke every time I make them – my husband say "oh we're having the giant olives." 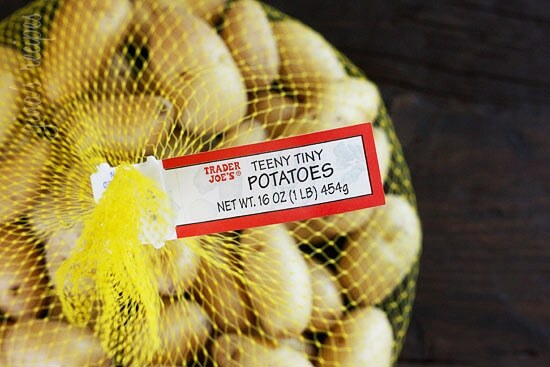 I have never heard of these tiny potatoes! How fun!!! You can use fingerling potatoes. I doesn't think I would add it to the crock pot, but you an reheat it later. The skin might get a little wrinkled. These are delicious, I make them about once a week. They're a huge hit with my husband! To the person who said she doesn't have a Trader Joe's, I've seen small dutch potatoes at Safeway. Not quite as small (and double the cost of TJ's) but they do the trick. My only constructive criticism would be that I found, on my stove at least, I have to cook them on medium. Absolute salty deliciousness. Thank you Gina! Awesome! So is everything in a tailgating party grilled? Forgive my ignorance! Headed to 1st PSU tailgate tomorrow! Ingredients are all ready packed and we will be grilling these up in the lots tomorrow! Can't wait! Thanks Gina! i used this recipe with red potatoes cut into quarters, so delicious! also switch the rosemary for dill to mix things up. Great recipe! SO simple, but so delicious – we all loved it! I did get the potatoes at trader Joe's and made this recipe. 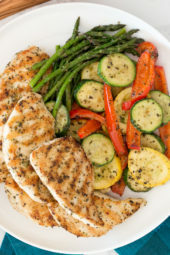 I served it with grilled marinated chicken breasts. 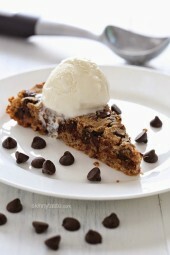 I LOVED this recipe and will make it again. It was a big hit with my family. Tabitha, sounds like your potatoes were bigger. Yum!!! These were so tasty!!! Ok, so I'm cooking these right now and it's taking WAY longer than 20 minutes. I finally cranked up the heat to medium because my family is waiting on dinner. My husband; (a great gardener) just brought in a whole basket of tiny potatoes. Can't wait to try your suggestion. Thanks for all your good reciepies. Diane, I know it's s easy in the oven!! Keep the recipes coming! Last night we had these potatoes,your corn on the cob in the oven recipe,which I think I will always make that way from on, and flank steak. i think make AT least 1 recipe of your per day. My husband and 3 children love just about everything,especially the zucchini bread and choc chip cookies. Thannnks!!!! hahaha…. I thought you were being cute with the name of your recipe until I saw that they are actually called 'teeny tiny potatoes'. Love it! I have been looking all over for tiny potatoes in Brooklyn, they seem to be nowhere. Never thought to look in TJ's! I'll be downtown tomorrow, I'll definitely have to grab some. Another Gina delight, thank you! That a true sacred combination Rosemary with potatoes, yumm!! You can wake me up at night for this! 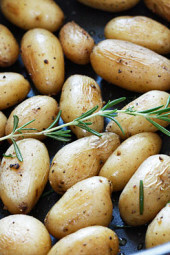 I love rosemary with roasted potatoes, it just works so well together! What a great side dish! I totally made this as a side dish last Friday night. Great minds think alike. And don't you just LOVE those teeny tiny potatoes?!?! Have you seen the blue ones that are about the same size? Not only are they cute and small but add a punch of color. I've had them the same way with rosemary and then I've also had them with blue cheese…. decadent! Love these! Try steaming for them about 10 minutes before you toss in the skillet—only have to cook in the covered pan about 10 minutes this way. Men love these and so easy. I don't have a Trader Joes in my area but I will often pick up a bag of the fingerlings. While I'm putting away groceries I'll put them on to boil and store them in the fridge. At meal time I grab the number I need, toss them with oil and sea salt and either pan fry, bake or grill them until they're crunchy on the outside. Since they are pre-cooked, it takes no time at all to get them on the table. These are one of my family's favorites. Yummy! Can't wait till the baby potatoes start being cheaper in New Zealand. I made these tonight with fingerlings. Took three times as long, but they were good! My fiance is OBSESSED with these tiny potatoes from TJ's (Trader Joe's)- in all forms, roasted, baked, boiled, mashed… They're so tasty! The calories should be the same for a pound if fingerlings. Lindsay, I'm all about easy clean-up!! Do they still sell the reynolds foil pockets? I haven't seen them lately, those were great! I have a bag of these right now! I love them so much, even more for their name. I like to cut them all in half and either pan sear them or roast them in the oven with just salt and pepper and a little olive oil. We stalk the store for Champagne grapes… they are only available here for the smallest window of time! How funny I have been making these for years. I prefer the little red potatoes and slice them up, stick them in an aluminum bag and put in the oven for about 30-45 minutes. I just put all the seasonings and olive oil in the aluminum bag. Easier clean up! They are so cute!! I haven't seen those at our stores yet, just the fingerlings. I'm going to keep my eyes out for them! I always buy these at TJ's. Thanks for the recipe! They sell these tiny grapes there called champagne grapes, I love those too! Tiny potatoes are my favorite too 🙂 So flavorful and super cute! I'm such a sucker for tiny everything too, especially tiny dogs haha looks good! We just got a Trader Joe's in Kansas, so I'll have to brave the crowds and go pick some of these little spuds up! mmmmmm….those sound so good…I have not tried them but now I will. Keep 'em coming Gina…so great! I love those potatoes too! I don't have a Trader Joe's anywhere near me, but whenever I travel, I make a point to stop by one. I was in Chicago this weekend and grabbed two packs of these little cuties. I'll have to try your recipe. Thanks for posting!